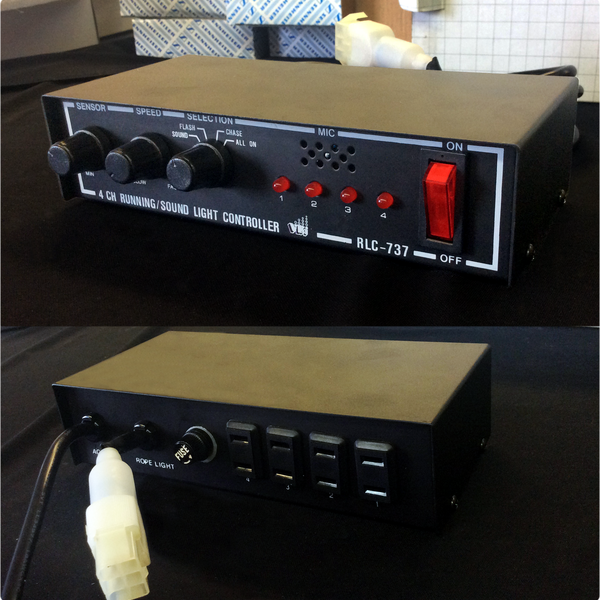 Four-channel, 1200-watt sound-activated lighting controller with chase, chase to sound, flash, all-on, and auto (16 patterns ) functions. Perfect for Mini Moons, Par cans, Pin Spots, Rope Lights and more. Includes 4x rear-mounted AC outlets for use with incandescent lights; dedicated Rope Light power outlet. Max. load 20 pcs of 12ft Rope Lights or 15 pcs of 16ft Rope Lights.